The excellent blog, Protect the Pope, is to close down. It was started in 2010 to help to highlight and counter increased levels of hostility and anti-Catholic propoganda being spread in the run-up to Pope Benedict XVI's visit to the UK. 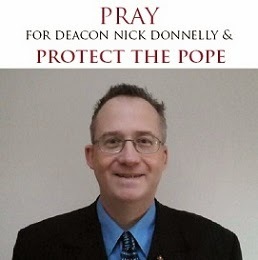 In the past four years, Deacon Nick Donnelly has worked tirelessly to bring instances of anti-Catholic sentiment and activity in the media to public attention, and to offer counter-arguments. Usually he has done this by making a simple statement of what the Catholic Church teaches. Unfortunately, in clearly stating and defending the doctrines of Holy Mother Church, Deacon Donnelly has helped to highlight dissent from those doctrines when it comes from those members of the Church who should know better. The inaction of the hierarchy of the Church in England and Wales in countering open dissent has been exposed. It would appear that such exposition has ruffled more than a few episcopal feathers. Bishop Campbell first ordered Deacon Donnelly to stop blogging at the beginning of March for a period of prayer and reflection, and then, at the end of April, refused permission for him to resume blogging. Bishop Campbell also indicated that he wished others to stop posting on the blog on Deacon Donnelly's behalf. Deacon Donnelly takes his vow of obedience to his Ordinary very seriously, and so, as he explined to The Catholic Herald, he is closing the blog. The injustice of the silencing of Deacon Donnelly (who only writes in defence of the Church's teaching) while other dissenting voices are allowed to continue unchallenged is almost inexplicable.